Cold spots: a fundamental problem, how to solve? Some 30 kilometres from Budapest, near the town of Szazhalombatta, lies Hungary’s largest power plant. With its 10 boilers and an installed capacity of well over 2.000 MW, the Dunamenti power station supplies 20 % of the country’s electricity. In addition, Dunamenti power station supplies district heat to the town of Szazhalombatta and process steam to the nearby refinery complex, MOL. 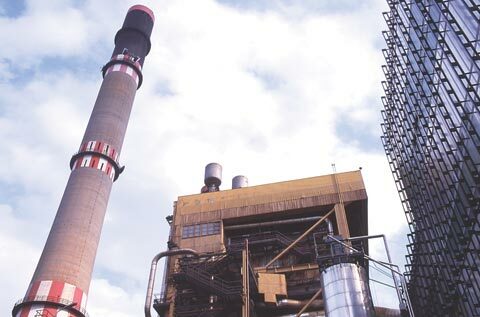 The base load capacity of the Dunamenti power station is made up of six oil fired boilers, rated at 220 MW each. The fuel for these units is a heavy residual oil from the neighbouring MOL refinery. This fuel presents a number of technical challenges and one of the most important is corrosion, which can affect the boiler and all downstream equipment in contact with the corrosive flue gas. 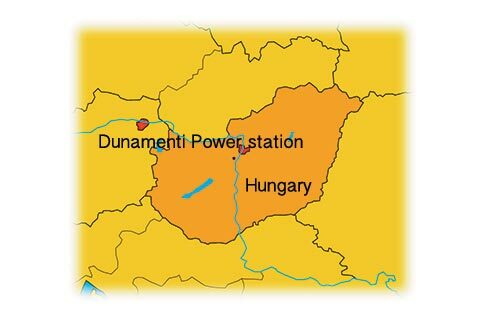 Electricity demand in Hungary will grow considerably over coming years and the immediate concern for the Dunamenti management is to ensure the best possible availability of the power station. To achieve this, modern burners are being installed on the oil fired units, which will improve economical as well as environmental efficiency. 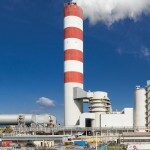 At the same time, the Dunamenti power station is solving a serious corrosion problem in its chimneys. 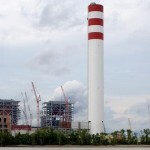 There are two, 200 metre high concrete chimneys, each with three internal steel liners. Although the exhaust gas temperature is 150-160 °C, the steel liners are under strong acid attack in many places, especially around ‘cold spots’. In 1994 Karrena GmbH, the German chimney builder (in cooperation with Kraftszer Budapest) introduced the PennguardTM Block Lining System to the power station and in that same year, the first steel liner was repaired and partially (540 m²) lined with PennguardTM. In 1995 and 1997, the same repair method was used for a further two steel liners and recently, in March 1998, the fourth liner was protected with PennguardTM. 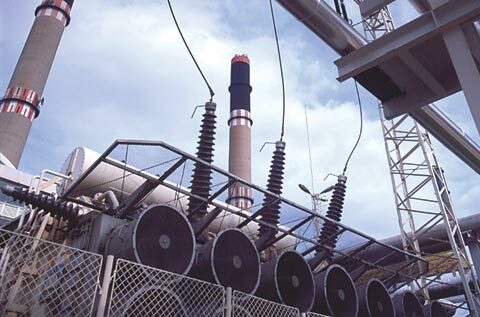 The power station currently has almost 2.200 m² of PennguardTM linings in use. In comparison with other fossil fuels, heavy oil creates one of the most acidic and corrosive flue gases. (H₂SO₄) and this is the main cause of corrosion in ducts and chimneys. For coal fired power plants, the SO₃ content of the flue gas is typically 1-2 % of its SO₂ content. This is where heavy oil is completely different; this fuel typically contains trace elements like vanadium, which act as a catalyst in the combustion process, converting large amounts of SO₂ into far more agressive SO₃. For an oil containing 2-3 % sulfur, it is quite possible to find more than 150 mg/Nm³ of SO₃ in the exhaust gas, depending on the combustion technology used. With such high amounts of SO₃ present, the acid dewpoint of a flue gas will be higher than 150 °C. In this situation, any steel surface with a somewhat lower temperature will quickly be covered with a strongly acidic condensate. At 125 °C, the sulfuric acid concentration of such a condensate will be around 75-80 % and this combination of temperature and acidity presents an impossible challenge to most materials. A PennguardTM lining is based on borosilicate glass and therefore has unlimited resistance against sulfuric acid. This has been proven once more in the Dunamenti chimneys, where the PennguardTM lining is completely unaffected after years of operation. 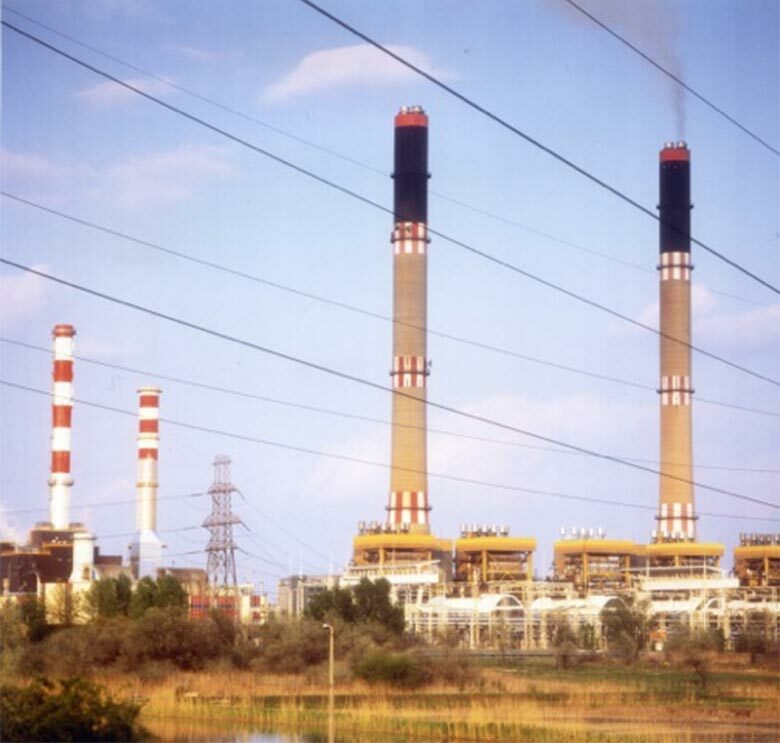 The corrosion problem in the Dunamenti power station chimneys centers around so-called ‘cold spots’. 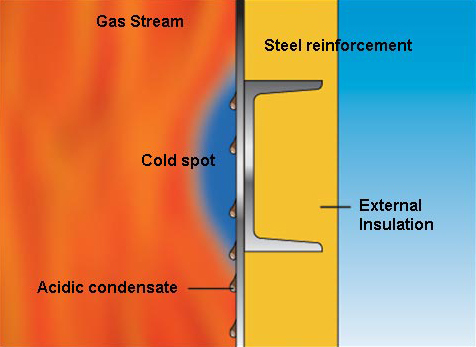 Cold spots can be caused by faulty or wet external insulation but also by the presence of external steel reinforcements. Cold spots constantly ‘drain’ heat from the gas stream, causing the formation of acidic condensate on the inside of a flue. Cold spots can be a problem in any flue gas handling system, regardless of fuel type and gas temperature. A PennguardTM lining forms a temperature insulation on the inside of the duct or chimney and so, by its nature, it prevents cold spots from occurring in the first place. This is an important advantage. New structures that will receive a PennguardTM lining can be designed without fear for cold spots. Furthermore, external insulation of the flues becomes unnecessary and can be omitted altogether. The top of each flue sticks out of the concrete shell and is especially vulnerable to cold spots. Cold spot on the inside of the flue due to outside steel reinforcement. 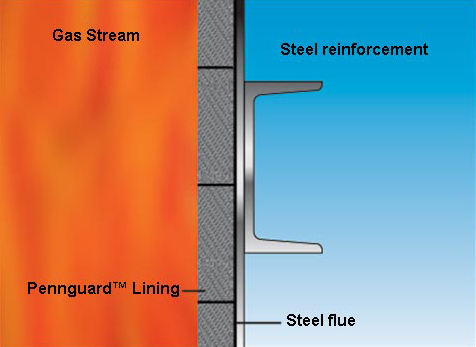 With an insulating PennguardTM Lining on the inside of the flue, outside steel reinforcements can no longer lead to cold spots. 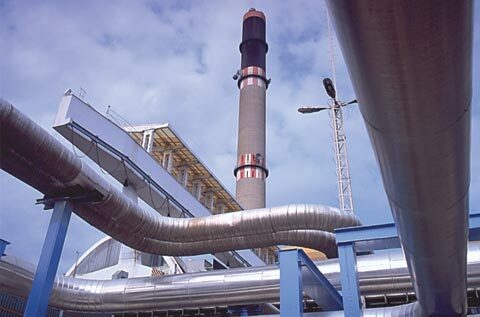 The chimney flues at Dunamenti power station require a lining system that is resistant to harsh operating conditions. In addition, they require a lining system that can be applied successfully, even under strict time constraints and difficult circumstances. Before the PennguardTM lining could be applied, the worst corrosion damage had to be repaired by the installation of new steel panels. In all other parts, the lining was applied over the existing steel substrate, which had already been affected by pitting corrosion. 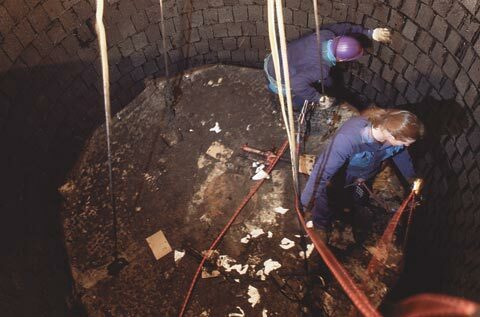 It is clear that, despite a thorough grit blasting of all surfaces, a slight chemical contamination with traces of acids or chlorides had to be expected, given the fact that the chimney had been in operation for a number of years. Furthermore, the existing welding in the chimney was somewhat irregular, as it was never meant to be lined. However, thanks to the robust and impermeable nature of PennguardTM, these factors did not affect the good result of the lining operation.